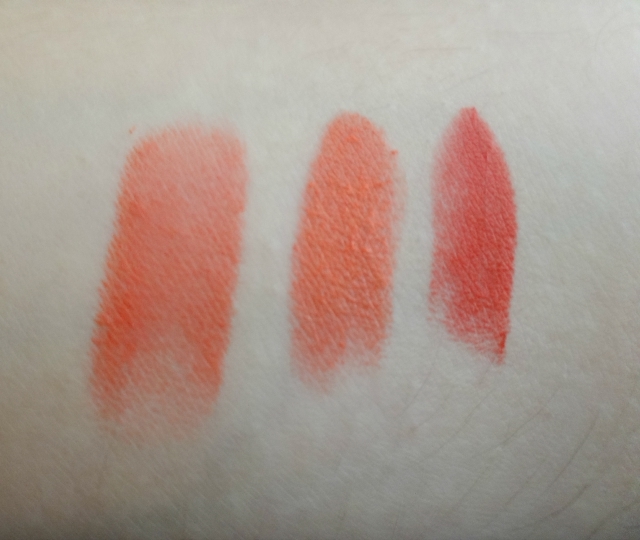 From left to right it is wet n' wild mega last lip color 909D Coral-ine , The body shop color crush 105 and MAC matte lady danger. 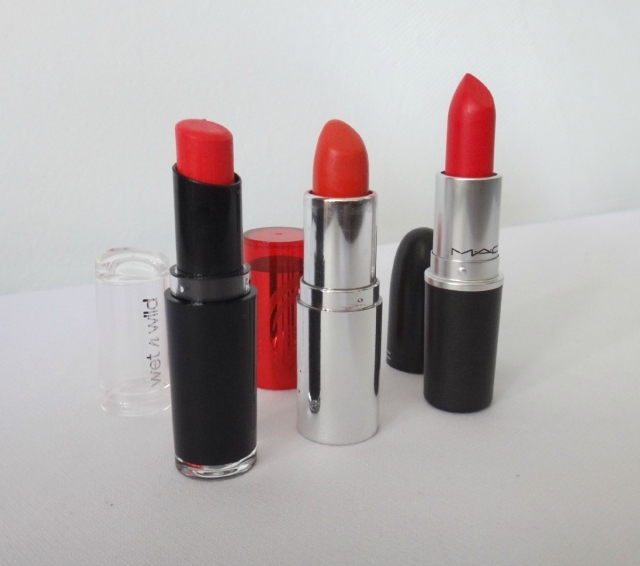 De izquierda a derecha wet n' wild mega last lip color 909D Coral-ine , The body shop color crush 105 y MAC matte lady danger. My favorite is one is The body shop color crush 105 ($12.50) because it is a really soft and moisturizing lipstick with decent duration. 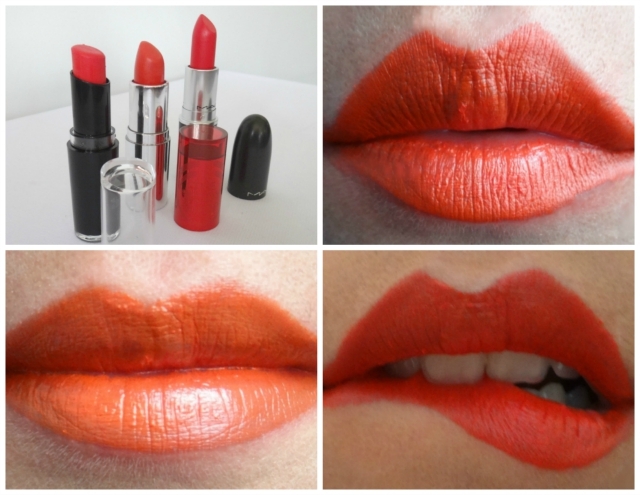 This color is described as matte on the website but the truth is that it is a bright orange with a glossy finish , it is a little bit sheer so it need a couple swipes to get an intense color but that also make it great to layer on top of other lipsticks. wet n' wild mega last lip color 909D Coral-ine ($2). The color tt is very similar to the MAC one with the difference that it has less coverage and in person looks more opaque, applying several layers makes it look exactly the same I swear!! So I would say it is a buildable color. It has a good duration, doesn't dry my lips that much and I love the price of course! Mi favorito de los tres es The body shop color crush 105 ($12.50) porque es un labial muy suave e hidratante con buena duración. El color lo describen como mate pero en realidad es un naranja brillante con acabado de lip gloss y un poco "transparentoso" o de cobertura ligera así que requiere varias capas para obtener un color más intenso. Ademas de usarlo solito tambien me gusta ponerlo sobre otros labiales para cambiarlos de tonalidad. En segundo lugar está Lady Danger de MAC ($16), me encanta el color porque es un naranja casi rojo pero es el color más oscuro de los tres. El acabado de este lipstick es mate y tiene una excelente duración , lo que no me gusta es que reseca mucho mis labios. Y por ultimo esta wet n' wild mega last lip color 909D Coral-ine ($2). Este labial es casi lo mismo que el MAC lady danger pero un poco más claro y opaco, para hacerlo que se vea similar hay que poner varias capas. La mejor parte es el precio, yo creo que por valer dos dolares se le perdona todo! Top/arriba: wet n' wild mega last lip color 909D Coral-ine, Left/izquierda: The body shop color crush 105, right/derecha: and MAC matte lady danger. Let's move on to the fun!! Last week I reached 500 followers on bloglovin (THANK YOU!!) and to celebrate I'm going to giveaway a MAC lipstick of your choice. To enter just complete any (or all) of the entries on the rafflecopter widget. This giveaway is international and if you're already following me in bloglovin or any of my social media accounts serve yourself with a free entry! Good Luck!! Ahora a la parte divertida. La semana pasada alcanzó los 500 seguidores en bloglovin (GRACIAS!!) y para celebrar estoy haciendo este sorteo de un lipstick MAC , el que que quieran! Para participar solo deben completar cualquiera de las entradas (o todas!) de la forma de aquí abajo. El sorteo es internacional y si ya me siguen en bloglovin o cualquiera de mis redes sociales pues practicamente estan participando! Buena suerte! !